Investing early pays off big time! The advantages of compound interest at any age are well documented. Are you wondering about how you should be investing for your retirement? Does the array of choices cause you to just shut down and avoid the subject entirely? Well, we're going to explain it simply, with some professional help, so you can see why and how you should be investing in your future right now — whether your company offers a 401(k) or not. Read on for more about the benefits of saving early, and the pros and cons of the three main types of IRAs. In David Bach's famous book, The Automatic Millionaire, there was a chart that showed the differences between someone who invested for just a few years at age 15 versus someone who invested every year from age 27 until age 65. Though 15 might be a little unrealistic, the advantages of compound interest at any age are well documented. 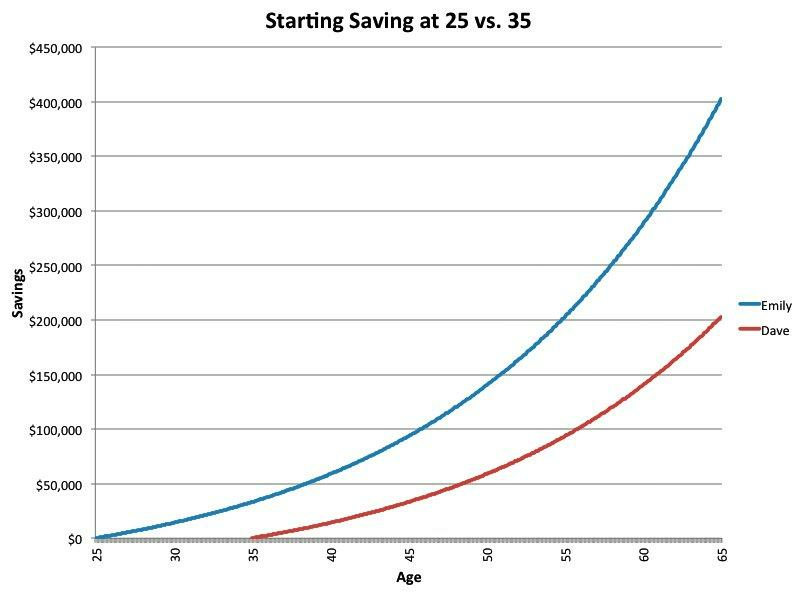 As Business Insider's Andy Kiersz shows, you can double your savings by retirement if you start at 25 rather than 35. "Emily" puts away $200 a month starting at 25, and "Dave" starts at 35. If they both earn a conservative 6% interest, Emily will have invested 33% more money by the time they're both 65, but she will have almost 100% more in savings. Of course, those hundreds of thousands might get you jazzed to start saving now, but you could be worried that $2,400 is too much for you to save each year. However, that's 6.8% of the $35,000 median income for a 29-year-old. If you really think you can't afford it, try working up to it. Cary Carbonaro, author of The Money Queen's Guide and a certified financial planner at United Capital, says, "Just start out at 3% of your income. You'll hardly miss that $100 per month at $25 per week contributed automatically from your paycheck. But definitely increase that percentage every year." She advises you to start early because the more money you have saved, the more flexibility you'll have when life happens. "You never know what's going to happen that could interfere with saving later," Carbonaro says, citing divorce, medical issues, unemployment, and even general life stages such as your childbearing years or when you're paying for college. So, you may have heard that contributing to your company 401(k), especially if it provides matching contributions, is always a good idea. But what if your company doesn't offer a match or doesn't offer any 401(k) at all? Then look into IRAs. Currently, there are three primary types of individual retirement accounts to choose from. Each has different pros and cons that may work best for your particular financial situation and age, although they all have the following aspects in common. You can start any IRA account for as little as $1 and automatically fund it through your bank account, direct deposit from a paycheck, or even a tax refund. You can contribute up to the standard 2016 IRA limits of $5,500 per year or $6,500 if you're 50 or older. You may also be eligible for the Saver's Credit of up to $1,000, if you meet the lower-income requirements. This is the way an IRA traditionally works. Your tax deduction is allowed up to the contribution limit if you (and your spouse, if married) aren't covered by a retirement plan at work, which reduces your taxable income substantially. It offers many investment choices that earn significantly higher than bank interest rates or the myRA's Government Securities Fund rate. Money cannot be accessed until retirement. Withdrawals before age 59 and 1/2 will incur taxes and penalties. Withdrawals after age 59 ½ are considered income and are subject to tax paid at your marginal tax bracket at that time. Withdrawals before age 59 ½ come with a 10% penalty (unless you meet an exception) and taxes paid at that time. The array of investment choices and places to invest is confusing. The account cannot be rolled over or converted to a Roth IRA without incurring taxes and penalties. The rollover is treated as taxable income, just like a withdrawal. You are required to begin taking minimum distributions at age 70 ½. This type of retirement account works differently than a traditional IRA. You can contribute up to standard IRA limits unless your income is above these 2016 income amounts. It's funded with already-taxed income, possibly taxed at a lower income tax bracket than at retirement, depending on your age and earnings. Withdrawals and earnings are tax-free, and are not considered income because the contributions were already taxed. You can withdraw contributions (but not gains, or earnings) at any time after the initial five-year waiting period with no penalty or tax, making this account double as an emergency fund. You'll have many investment choices that earn significantly higher than bank interest rates or the myRA's Government Securities Fund rate. There are no minimum required distributions at any age, so you don't have to spend this money in retirement if you don't want or need to. You can access your money at any time (so it could be spent). Contributions are not a deductible tax expense. Upon your death, beneficiaries are still subject to the required minimum distribution rules of a traditional IRA. The U.S. Department of the Treasury recently introduced the myRA account. It's designed to provide a "starter" retirement savings option that works like a Roth IRA for people without access to a retirement plan from an employer. The account is backed by the U.S. Treasury. It's funded with already-taxed income and withdrawals are tax-free, like a Roth IRA. Contributions (but not gains, or earnings) can be withdrawn at any time, with no five-year waiting period and no penalty or tax, making this account double as an emergency fund. Your myRA can be rolled into a standard Roth IRA at any time. The balance must be transferred once it reaches the $15,000 limit. U.S. Treasury investment offers very low returns. Interest earned is at the same rate as investments in the Government Securities Fund, which is 1.500% APR as of August 2016 and had an average annual return of 2.94% over the 10-year period ending December 2015. You can access your money at any time (so it could be easily spent). You may have also heard there are all kinds of different "solo" 401(k) plans and others called a Simplified Employee Pension Plan, but these are only for you if you're self-employed. 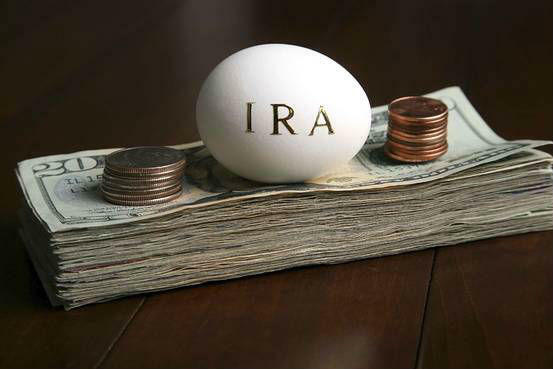 If you really want to avoid brokerages and investment decisions for your IRA account, and want a very safe (but low-interest-earning) account over the long term of your retirement savings, consider the myRA to start out, which is guaranteed by the U.S. Treasury and can be transferred to a Roth IRA at any time. Alternatively, for rolling over larger balances of the same type of IRA, search for banks with the best rates and those offering a bonus, which is common during tax time and could work out to be icing on the cake, according to Ken Tumin, interest rate expert and founder of DepositAccounts.com. Readers, which IRA do you think is better for you? How long have you been saving for retirement? Share your experiences in the comments below. 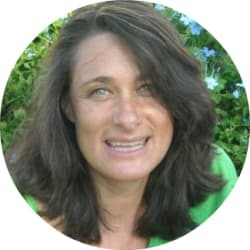 Naomi is a freelance personal finance journalist and blogger who reports on family finance and money news. She covers credit, debt, banking, saving, spending, consumer behavior, and how to take advantage of shopping deals and discounts. She never writes about it if she hasn't seen it, experienced it, or tried it first-hand!